When I made my first couple of trips home after moving to Berlin, there was one thing which dominated my mind: food. I was barely off the plane before heading into the nearest shop to buy bottles of Lucozade, bags of Tayto, etc. The list was long. In fact, if your are interested in my favourite treats from home, you can click here to read a previous blog post where I list them. This gluttonous behaviour was repeated anytime I went to London as a selection of my favourite food items could also be found there. Then, something changed. It was kind of a sad time when I realised that my taste buds were becoming more accustomed to the food found in Berlin. I simply was not enjoying the same foods anymore and during my last time home, I set myself up for disappointment. Luckily, not all of my previous food habits let me down. A trip to Panda Mama was an absolute success! Panda Mama is a Chinese restaurant located on Parnell Place, Cork City. It was an establishment I visited a lot when I lived back in the homeland and I always enjoyed it immensely. However, the last time I had Chinese food in Ireland (not in Panda Mama), I was not satisfied. Entering the restaurant with a negative attitude encouraged me to set up a game plan. Therefore, I decided to have one dish which was something completely new, and another which is an old favourite. 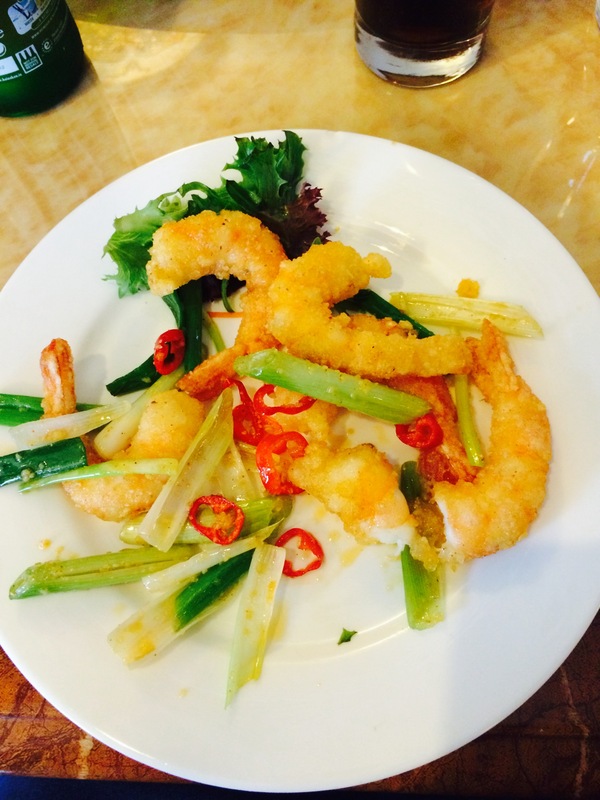 For my starter I choose salt and peppercorn prawns. Not only had I never sampled this particular dish before, I had never even eaten a prawn. It was a challenge I was ready to undertake. I ordered it as a starter dish and it was fan-tas-tic. The prawns tasted amazing and the batter which covered them was perfectly cooked. It was a very spicy dish, due not only to the batter but the addition of spring onion and red chili, making it a perfect choice for me. Now I am obsessed with this dish and I cannot find anything similar in Berlin. 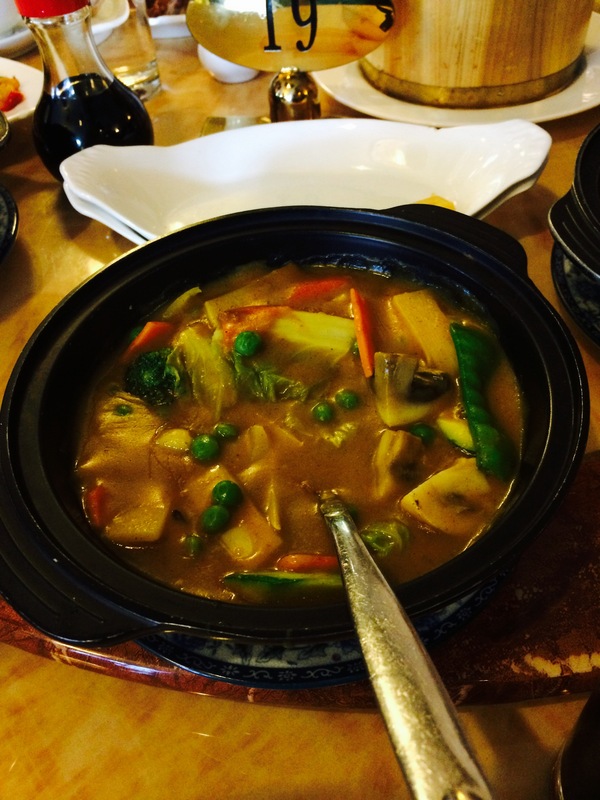 My main course was an old favorite – vegetable curry. I also enjoyed this dish very much but admittedly not as much as my starter. The portion was plentiful and I was also pleased with the wide selection of vegetables contained in the curry. Often it is the case that just peas, onion and beans are included. I had my curry along with some egg fried rice and a handful of chips snatched from the plates of others. So, what else is good about Panda Mama? Well, for one, they do an awesome early bird menu for €16.50 person. This is what I got minus the tea/coffee as I am not a fan of hot drinks. The restaurant itself is nicely decorated and spacious which means you are not sat nearly on top of the other diners. The staff were very friendly and the food was served in expert timing – something I am not used to having lived now for 3 years in Berlin. Overall, Panda Mama presents a pleasant dining experience with great service and good food. Give it a try if you haven’t already! *This post is not sponsored. The meal was paid for with my own money. Thanks! I like to try new foods as often as I can. There are just too many delicious items out there to be boring.